You are here: Home » Life Issues & Bioethics » Contraception & Abortion » Tell Your Senator: Stop HHS Mandate! 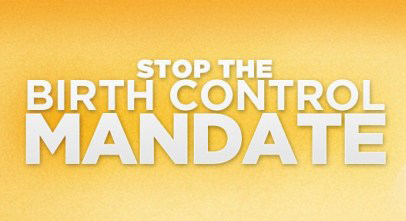 Tell Your Senator: Stop HHS Mandate! The Obama administration’s attack on religious liberty is intensifying. It now claims the right, under the new HHS Mandate, to force hundreds of thousands of Catholics, working in thousands of Catholic organizations, to violate their conscience and the teachings of their faith on the Life issues. The new Mandate is particularly alarming to us at Population Research Institute, since we exist to promote the Church’s teaching on abortion, sterilization, and abortifacient contraception. Obama’s claim that we won’t have to pay for these services because the insurance companies will pick up the tab is ludicrous. As everyone knows, the insurers will simply pass the cost along to us. His Mandate raises another, equally important issue: If the government can define what it means to be “Catholic,” then everyone’s religious freedom is at risk. In the United States, religious liberty does not depend on the benevolence of who is regulating us. It is our “first freedom” and respect for it must be broad and inclusive — not narrow and exclusive. Catholics and other people of faith and good will are not second-class citizens. And it is not for the government to decide which of our ministries is “religious enough” to warrant religious freedom protection. Obama has decreed, in effect, that Catholic hospitals and charities, such as PRI, are not free to follow the tenets of their faith, and is seeking to impose his own immoral, anti-life agenda on them. This must not stand. PRI calls upon every American concerned about religious liberty to immediately contact their legislators to support the Respect for the Rights of Conscience Act (HR 1179 by Congressman Jeff Fortenberry and S. 1467 by Senator Roy Blunt). The bill could be taken up in both the House and the Senate this week. Contact your Congressman immediately and ask for his support for this legislation. If he hasn’t yet co-sponsored HR 1179, ask him to do so. We must let House leadership know that Americans overwhelmingly support religious liberty. The Senate vote is expected as early as today or tomorrow. S. 1467 not only reverses the HHS Mandate, it preserves the right of insurance issuers, providers and purchasers to negotiate a health plan excluding items that are against moral and religious convictions, as well as providing conscience protection for All Americans. This legislation was introduced in early 2011, long before the HHS Mandate. If you get a busy signal, call the Capitol Switchboard at 202-224-3121 and ask to be transferred. If one of these Senators represents your state, it is critical that you call their office and tell them to protect religious liberty. If you have a personal relationship with these Senators, please emphasize that a vote in favor of S. 1467 is a vote to preserve religious liberty in the United States. Also, please forward this to all of your friends and family who live in these states. Please call and help us get the word out. This is our moment to protect the future of America for our children and our faith.